As the economy booms with steady job growth, and the housing market thrives save some inventory issues, across most of the U.S., mortgage delinquency rates — or the percentage of loans with late payments — sit at a 10-year low, according to the latest CoreLogic Loan Performance Insights Report. The report measured 30-day or more delinquency rates for January 2018 at 4.9 percent, down from 5.1 percent the year prior, a 0.2 percentage point decline. But in areas struck by hurricanes in 2017 — and in some Northern California metros impacted by wildfires last year — serious delinquency rates, representing mortgages that are over 90 days past due, remain higher than the rest of the country. 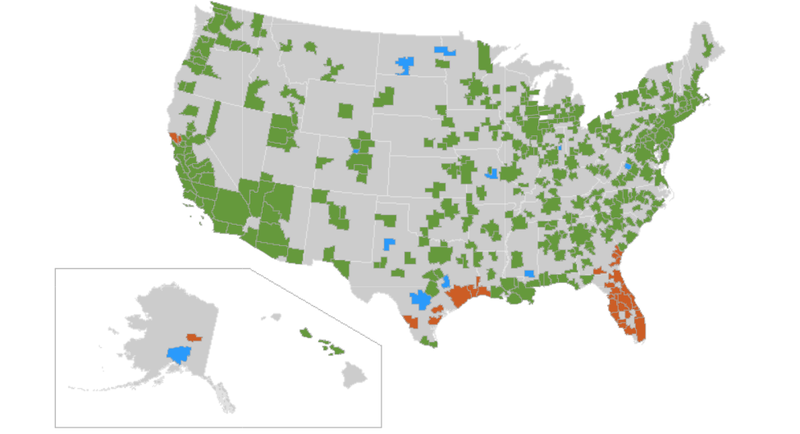 CoreLogic’s research identified 31 metros where the serious delinquency rate increased (represented in orange above). The company said that after disaster strikes, homeowners are considering a number of options that may lead to them delay their mortgage payments. Making a mortgage payment on a home that is temporarily uninhabitable coupled with the expense of a rental “can be overwhelming” if not budgeted for properly by the homeowner, said the company in an email to Inman. But for the rest of the country, the 30-day or more delinquency rates, the most comprehensive measure of mortgage performance, boded well for a healthy U.S. market. “Except for the metropolitan areas affected by natural disasters, most of the country has seen delinquency and foreclosure rates move lower over the past year,” said CoreLogic president and CEO, Frank Martell, in the report. The rest of the country is reaping the benefits of low unemployment, rises in income and home price growth which is building home equity, he said. “These two economic forces coupled with high-quality underwriting have lowered overall delinquency rates,” Martell said.